Many cities are considering the conversion of their lighting infrastructure to LED lighting and sensor-based networks to reduce costs and add capabilities. LED lighting allows for more even lighting at half the cost of the current technology. Because lighting involves a cost stream (payments for electricity), it's possible to use private financing (frequently called a "public private partnership") to pay for the capital costs of the conversion. At the same time, many cities are looking to off-load the management and operations of the lighting infrastructure in a long term deal. -- the TALQ Consortium "aims to set a globally accepted standard for management software interfaces to control and monitor heterogeneous outdoor lighting networks"
Along with the ability to calibrate lighting in a more localized fashion and with online monitoring of system uptime and individual outages, LED sensor-based lighting networks can integrate other capabilities can be added, ranging from free wifi connectivity to Shot Spotters to detect gunshots. The city, in partnership with the University of Chicago and the Argonne National Laboratory, recently began constructing the Array of Things — a network of 500 data sensors that will track the city's vitals. Perched on traffic signal poles, its sensors will monitor things like traffic flow, pedestrian traffic and air quality. The Array of Things is funded largely by a $3.1 million grant from the National Science Foundation, and is set to be fully installed by 2018. DC is one of the cities with a process underway for doing the conversion. Although at this point, it's at the "Request for Expressions of Interest" stage, and it will probably be a 3-4 year process of information gathering, putting out a tender, selecting a contractor, and starting the conversion. AMA recommended guidelines for LED lighting specify a different light from the current industry standard. LED street lights are also in the news because typically, the industry standard for LED lighting for street lighting is 4000 Kelvin, but the American Medical Association recommends 2700 Kelvin ("Citing Health Concerns, Some Cities Consider Dimmer LED Streetlights," Stateline), and the industry hasn't settled on a lighting solution that puts out that frequency of light while balancing cost and longevity of the fixtures. However, some cities appear to have found lighting solutions that meet the AMA guidelines. Most cities don't have lighting master plans. Ideally, the conversion of the city's street lighting network would have been preceded by the creation of a lighting master plan ("Lighting as an element of urban design and community identity: Cleveland chandelier + Chicago lighting design framework plan design competition," 2014), which could have prioritized lighting in terms of sustainable mobility. Yet another reason to consider the creation of a lighting master plan is the controversy over the addition of digital billboards ("advertising lighting") to the city's visual landscape as many people argue against billboards more generally from aesthetic concerns ("Fight over electronic billboards' place in DC moves to Nationals Park," Washington Post). On the other hand, some argue that such lighting is an element of urban vibrance and vitality. 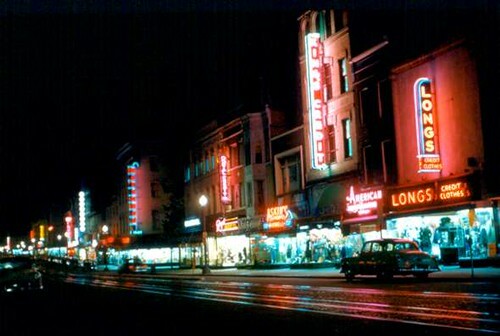 When DC had a more vibrant set of independent retail businesses, bright signage was an element of the identity of those businesses and the city's downtown business district. F Street, Downtown Washington, 1950. LUCI | Lighting Urban Community International is an international association of cities interested in lighting as an element of community identity. Washington Globe lights on 8th Street SE. are focused on lighting the sidewalk, not the roadway, although the density of the lighting plus illumination from the buildings provides adequate lighting for the roadway as well. Looking at neighborhood lighting issues more broadly. It happens I am on the "Public Works and Infrastructure" committee of my neighborhood commission, we have been dealing with the issue for a few months in a wide-ranging way. Along with the LED issue that has been brought up by some residents, I have been pushing to identify lighting issues in primary pedestrian corridors and commercial districts and near schools and other civic assets (see "Night-time safety: rethinking lighting in the context of a walking community," 2014). Perhaps not surprisingly, it seems as if the city does not have a standard protocol for addressing this. 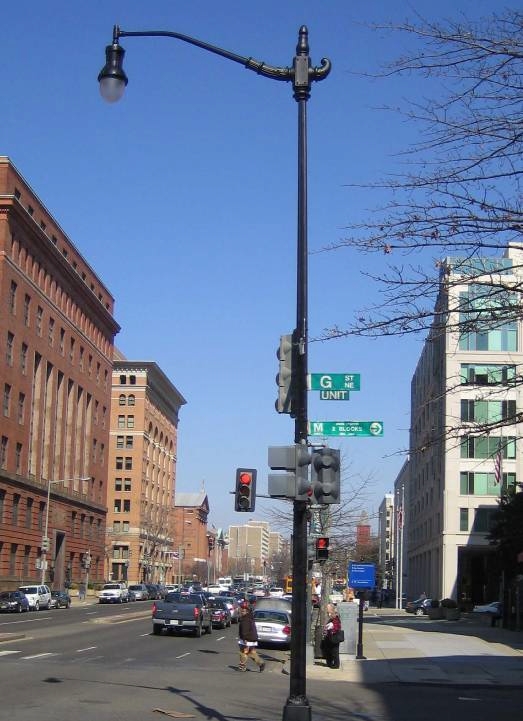 We have also discussed the issue in terms of lighting "street furniture" as an element of community identity systems and "branding," specifically in DC this means using what is frequently referred to as the "Washington Globe" light pole and fixture. In Washington's "L'Enfant City"--the core of the city--overhead utility wiring is forbidden (with an exception for the streetcar wiring infrastructure on H Street/Benning Road NE) on the face blocks (typically telephone and cable utilities are strung from the interior of blocks, while the utility infrastructure for electricity is underground, the Washington Globe street light is standard. Wikipedia photo of a teardrop style street light. In the outer city, where the more traditional wooden pole utility infrastructure is present, installing Washington Globes is difficult, even in a historic district, because the city doesn't want to have two different lighting systems up, and the cost to underground the utility infrastructure is exorbitant. Rather than rely on the street-focused "cobra" light and in keeping with the city's historical and architectural identity, the city has added the "teardrop" light for use in these areas. Even those these lights are still focused on motorists, by positioning the light fixture closer to the street, sidewalks also receive better light. 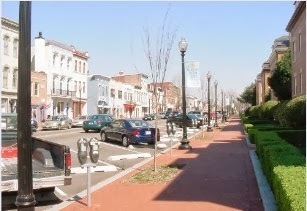 To provide even more lighting, mostly deployed in commercial districts, "sidearm" lighting has been added in some locations, placed at a height much closer to the sidewalks. Sidearm sidewalk lighting using the teardrop fixture in the Brookland 12th Street NE commercial district. However, separately, there is a program to underground certain utility infrastructure in the Outer City, to improve reliability and resiliency of the system in the face of weather events--for the most part, aesthetic concerns aren't a primary consideration. 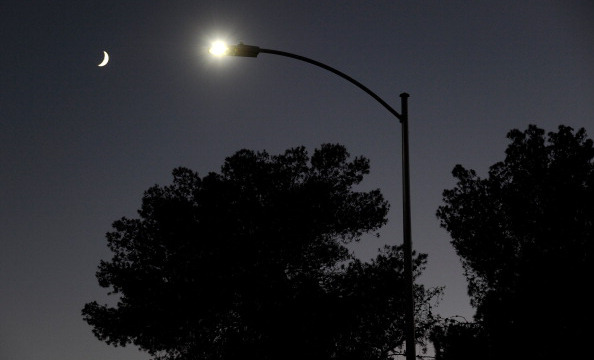 American City & County Magazine is offering a webinar later in the week on LED street lighting, called "Will LED Street Lights Give Your City the Blues?" on Thursday, March 9, 2017 - 2PM ET / 11AM PT. Review from a historical perspective, how outdoor LED luminaires have evolved from the early installations nearly a decade ago to the products of today with an emphasis on both economic need and the human experience. Examine the American Medical Association’s recommendations as it relates to community-based LED lighting and its concern with blue-rich light. Describe the many known benefits of LED lighting and its positive impact on communities. Identify LED streetlight implementation risks as it relates to the human experience and describe strategies that can help communities succeed in the eyes of their residents. somewhere I read that one Midwestern city or town had problems with LED lighting because they found that the LEDs emit such a low level of thermal energy that snow and ice built up atop the lighting fixtures and covered them, blocking out the lights. I've always disliked Washington globes because the do a better job of lighting the sky, insides of houses, and sides of buildings better than anything on the street. they can be capped, either from the outside with metal, or internally. They can be capped but in general yes they are very difficult on the eyes and create a great deal of light pollution. The LED melting issue is real but less of an issue here. I'd be also concerned with cost -- I'm sorry, running a sodium light is not going to cost more than a LED. This is just an excuse to replace the lamps at a huge cost. Durability is also a lot worse than projected. There is a 50% reduction in use of electricity from LEDs. That's a very real, quantifiable benefit. Hmm. I'm seeing various differences on the internet on electric usage. Again, I think that is you want to make LED more efficient you have to really re-think the entire design of the lamp. The Globe is not a good choice. DC should revisit the ban or absolutist restrictions on billboards and electric signage. This city was at one time- up until after WW2 a great shopping mecca for the entire SE USA and thus had attractive outdoor signage[ like the downtown historic night picture you show here] and we have abandoned this for a supposedly austere sterile or " sober" look to DC- it is akin to the absurd restrictions on overhead streetcar wires that was used as an excuse not to have them at all. DC is undergoing a major resurgence and some of these anti- city policies need to be revamped or just done away with period. DC as a city and "The Vision Thing"